Dissolve the yeast in the warm water in a small bowl. Place the salt, butter, and boiling water in the food processor and process until the butter is melted. Add 1½ cups of the flour and process until blended. Add the dissolved yeast and process until blended. Add the remaining flour and process until blended, and then for 20 seconds to knead the dough. If you wish to freeze the dough, place in a freezer bag and remove the air. Allow to defrost at room temperature for about 5 hours. Knead the dough by hand for a few strokes and proceed. Oil a bowl, and place the dough in the bowl, covering with a clean dish towel. Let rise until doubled. Oil the pizza pans and sprinkle lightly with cornmeal. Press the dough into the pan, and oil the dough slightly. Cover with plastic wrap or a clean dish towel and let rest at least 10 minutes. Meanwhile preheat the oven to 400°. 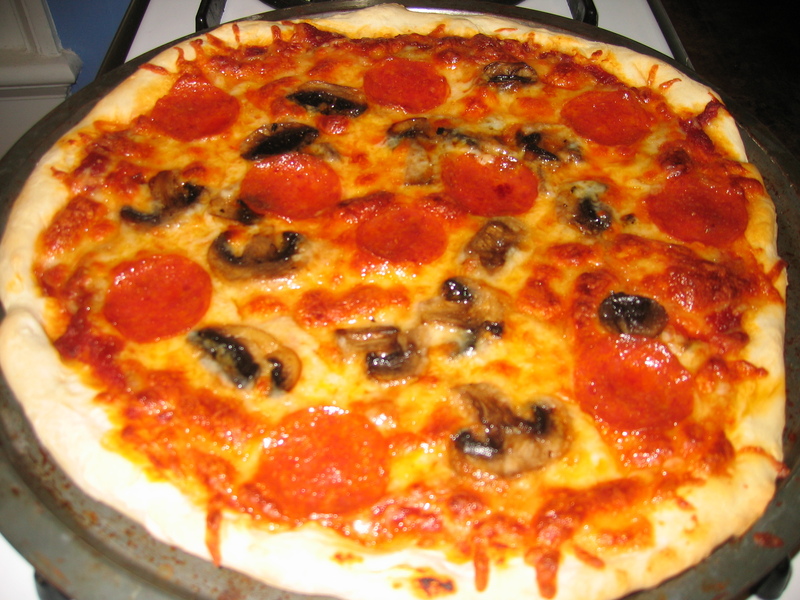 Add toppings to dough and bake for 20 minutes or until done. I always sauté any mushrooms or onions that I’m going to put on my pizza, because they won’t cook enough during the baking time. This entry was posted on November 4, 2009 at 3:57 pm and is filed under Breads & Sandwiches, Cafe Sassone General, Recipes. You can follow any responses to this entry through the RSS 2.0 feed. You can leave a response, or trackback from your own site.